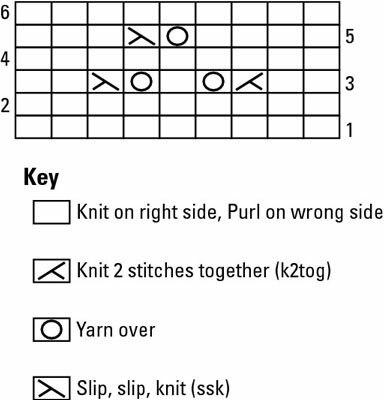 Charts for knitted lace, like other charts for knitted stitch patterns, “picture” the patterns they represent. Knitted lace incorporates two simple knitting techniques: a yarn over (an increase that makes a small hole) and a decrease. Every opening in a lace fabric is made from a yarn-over increase, and every yarn over is paired with a decrease to compensate for the increase. Yarn-over increase and decrease symbols: The two symbols you find most often in lace charts are the one for a yarn-over increase (usually presented as an O) and some kind of slanted line to mimic the direction of a decrease. This sample chart shows the cloverleaf lace pattern with a decrease. The decrease symbol appears in only one square, even though a decrease involves 2 stitches. Charting the decrease this way allows the yarn-over symbol to occupy the square for the decreased stitch. Sometimes the yarn over shows up adjacent to the decrease, as it does in this pattern, but it doesn’t have to be placed there. No-stitch symbol: A lace chart sometimes has to show a changing number of stitches from one row to the next. 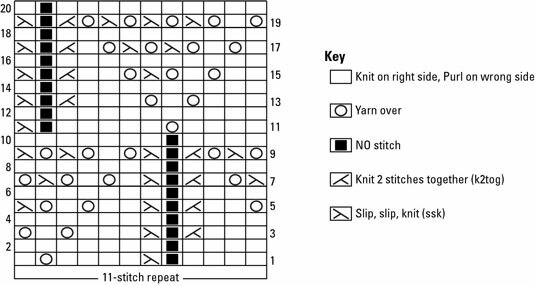 To keep the stitches lined up on the chart the way they are in the fabric, the chart indicates that a stitch has been eliminated temporarily from the pattern by using the no-stitch symbol in the square that represents the decreased stitch. This symbol repeats in a vertical row until an increase is made and the stitch is back in play. The black squares in the chart hold the place of the disappearing and reappearing stitch. Using the no-stitch symbol allows the grid to remain uniformly square. When you’re working from a chart that uses the no-stitch symbol, skip the symbol when you get to it and work the next stitch on your needle from the chart square just after the no-stitch symbol. When you suspect that your stitch count is changing, it probably is! If the stitch pattern doesn’t say anything about the stitch count changing but you suspect that it does, check the instructions. Add up the number of yarn overs and decreases (don’t forget that double decreases take out 2 stitches) in each row of a written or charted pattern to see if they’re the same. Knitted lace is a fabric made with yarn overs and decreases, but you can make lace-type fabrics in other ways. Using a very large needle with a fine yarn makes an open and airy piece of knitting. For extra visual interest, use a self-patterning sock yarn.